Do you love the taste of oranges? 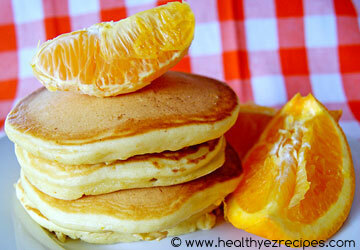 Then you will love these orange pancakes. Light and airy with just a hint of citrus, these would be perfect served up for breakfast with some fresh orange or mandarin segments. Or why not try drizzling a tangy orange sauce over the top. The great thing about these pancakes is they can be enjoyed any time of the year and will bring a ray of sunshine to your breakfast table on even the dullest day. Sift together the flour, baking powder, baking soda and salt into a large mixing bowl. Add the sugar. Stir the ingredients together with a whisk. You will need two eggs. Place one in a mixing bowl, and separate the other one. Add the egg white to the bowl and save the yolk for another recipe. Add the buttermilk, oil, grated orange zest and orange juice. Whisk until all the ingredients are combined. Add the buttermilk mixture to the flour mixture and stir until the ingredients are just combined and most of the lumps are gone. Preheat a large non-stick griddle or skillet on medium heat. 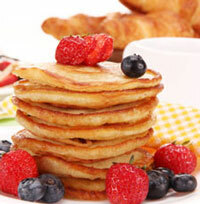 Drop a ¼ cup of the mixture onto the hot pan and let it spread. Cook for 1 – 2 minutes or until bubbles begin to appear on the surface. Once the edges look cooked, slide a spatula underneath and flip them over. Continue cooking for a further 2 minutes or until the bottoms are lightly browned. 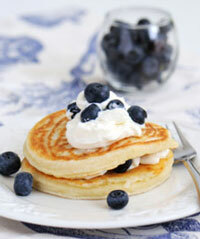 Serve with maple syrup or orange sauce. Place the sugar and cornstarch into a small saucepan and stir in the water and frozen orange juice concentrate. Cook over a low – medium heat and stir until thickened and bubbles start to appear. Simmer for 2 minutes then remove from the heat.